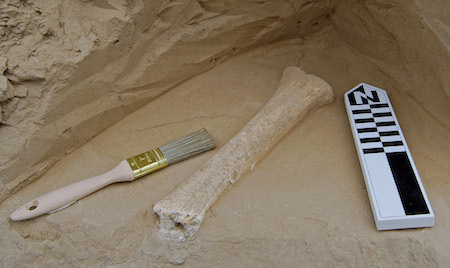 The Coyote Canyon Camel Bone Site is on the same property as the mammoth site. The MCBONES Research Center Foundation oversees research and education at the site. 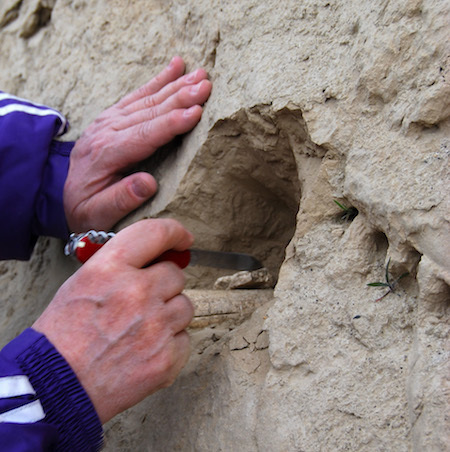 In April 2011, during site reconnaissance following a work party at the Coyote Canyon Mammoth Site, Bill Mauldin noticed a piece of bone in the wall of an excavation cut, approximately 300 meters west of the mammoth site. Follow up excavation by Bax R. Barton revealed that it was an isolated bone. 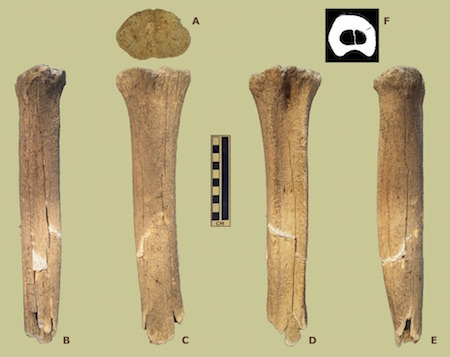 The bone was identified (Adams, et al. 2017) as a partial right metatarsal cannon bone (rear foot bone) of a Camelops hestemus (“Yesterdays Camel”). Radiocarbon analysis yielded a calibrated age of about 25,360 +/- 145 calBP (calibrated years before present). 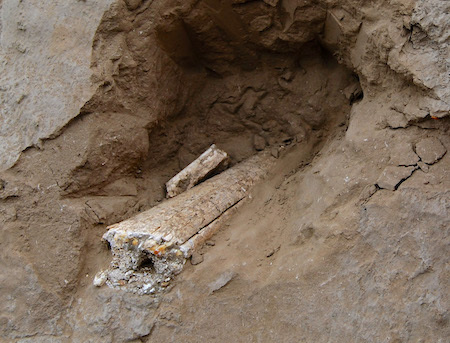 The bone was recovered from a sequence of fine-grained Ice Age flood deposits. Optically Stimulated Luminescence (OSL) analysis of a sample collected ~50 cm below the bone, yielded an age of 16,480 +/- 2,440 years ago. 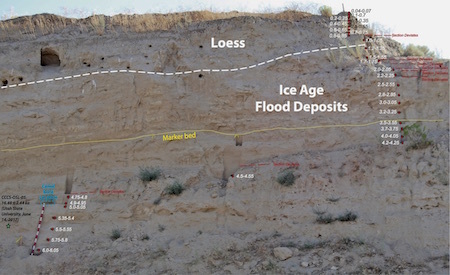 Since the age of the bone appears to be nearly 9,000 years older than the sediments it was found in, this suggests that the bone was ripped up from its previous burial place and redeposited by the Ice Age floods (Adams, et al. 2017). 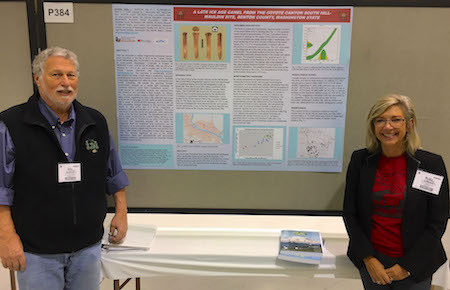 Betty Adams, Bax Barton, and others presented the poster "A Late Ice Age Camel From The Coyote Canyon/South Hill-Mauldin Site, Benton County, Washington" at the 129th Annual Meeting of the Geological Society of America in Seattle, Washington on October 22-25, 2017. The authors concluded that their modest record of Camelops hestemus provides initial documentation of a 14C/AMS dated specimen of Yesterday's Camel from the Columbia Plateau of western North America.